I purchased this wooden jewelry chest/box at a garage sale last summer. It had a few condition problems. One of the drawers stuck. A rasp on the bottom of one side of the drawer did the trick. It needed gluing and clamping on one corner. I used wood glue, and clamped it overnight. It had stickers/rub-ons and tape on the sides. I used Goo Gone and a little sandpaper to remove the tape and stickers. I love Dixie Belle Chalk Finish Paint in CAVIAR ! 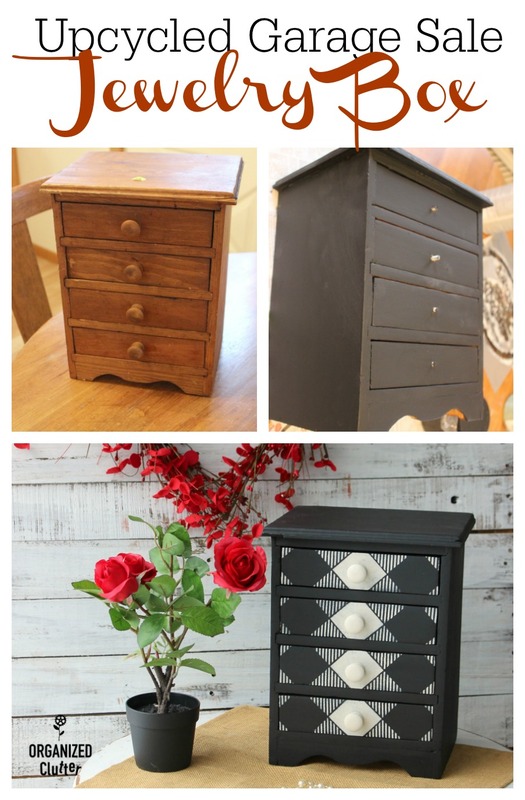 Dixie Belle Paint distresses easily, goes on without priming or sanding (in most cases), and does not require a sealer or wax. I brushed on two coats of Caviar. I used a Zibra 2-Inch Paint Brush , and had almost NO brush strokes! I highly recommend Zibra brushes. 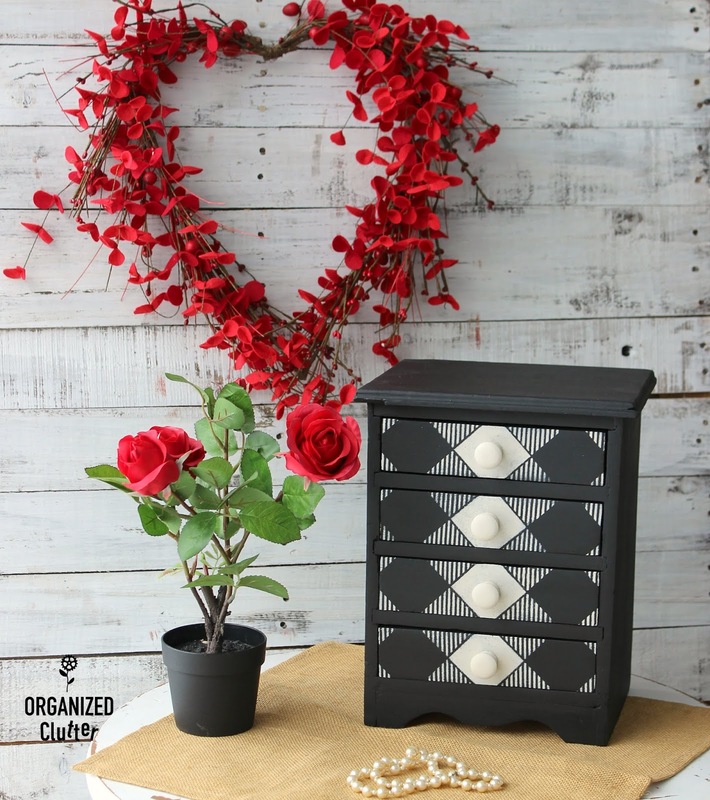 I painted the wooden knobs, and stenciled the drawers using Dixie Belle Chalk Finish Paint in Drop Cloth . I put the knobs on toothpicks to paint them and then pushed the toothpick into a foam tree to let them dry. I used my "TRUSTY" and "WELL LOVED" *Old Sign Stencils buffalo check stencil to add a design to the drawer fronts. I laid the stencil on the diagonal over each drawer, lining up the design on each drawer. The "white section" of the stencil shows the drawer front part of the buffalo check stencil. 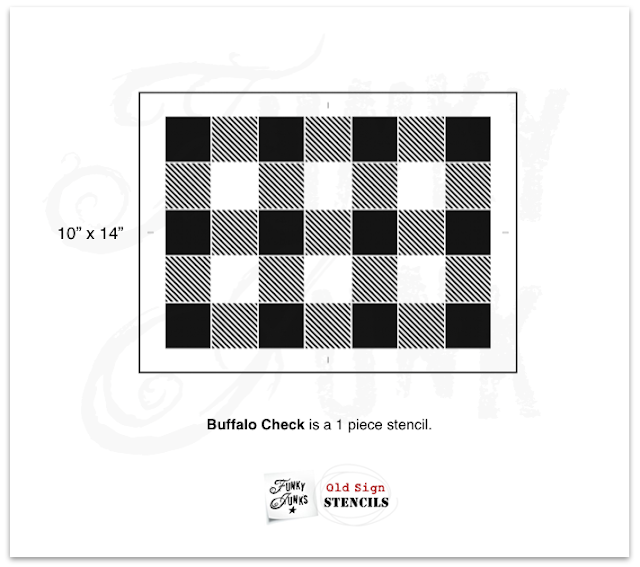 The buffalo check stencil actually turned out in a sort of "Harlequin" pattern. I like it! Perfect for a jewelry box. 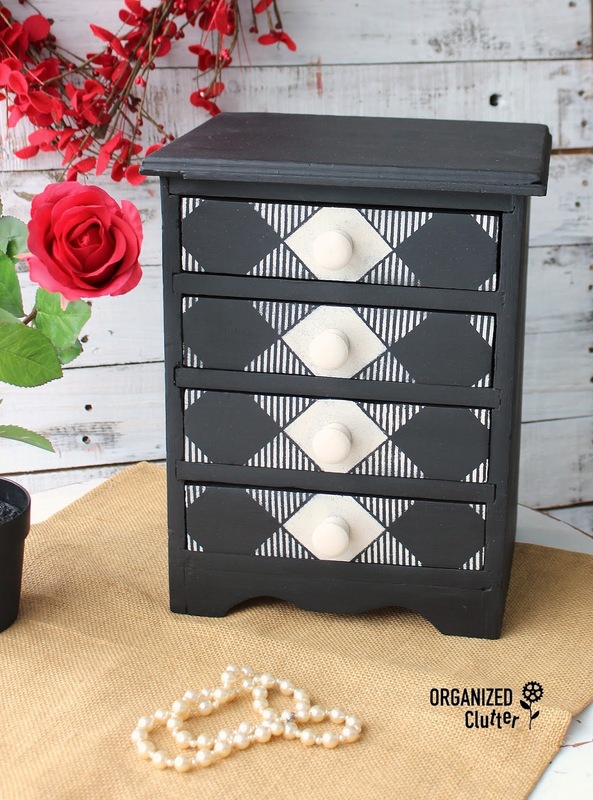 I sealed the jewelry box with Dixie Belle Best Dang Furniture Wax in Clear using an Intex Pfc Precision-fiber Paint & Cleaning Rag to apply and wipe down the wax. 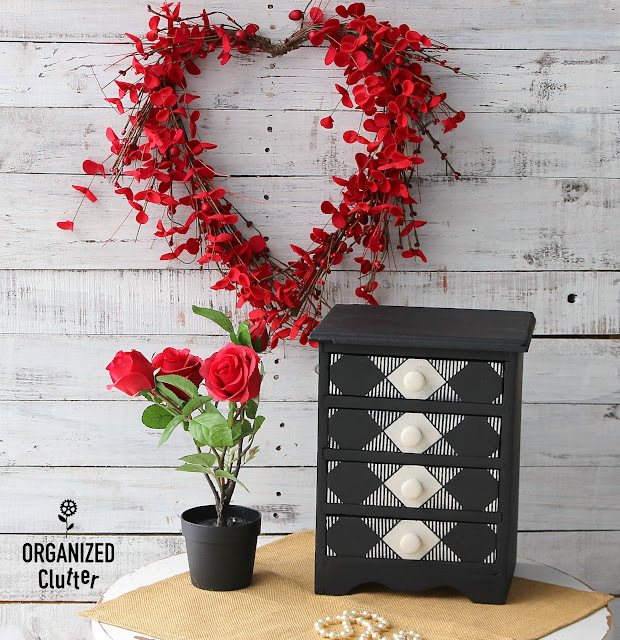 I will be able to store all of my Valentine's Day jewelry in my new jewelry case! HA HA! I don't have any Valentine's Day jewelry! 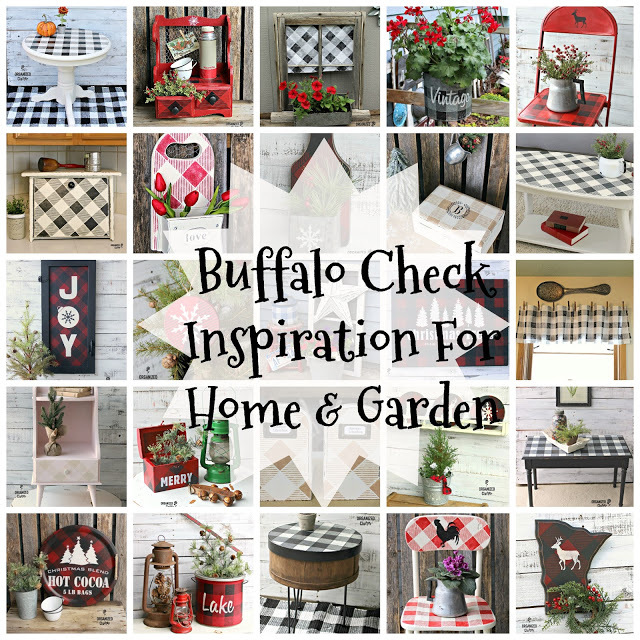 Much more buffalo check stencil inspiration HERE. That transformation is incredible. You are so talented! What a beautiful transform! Love it's new look!